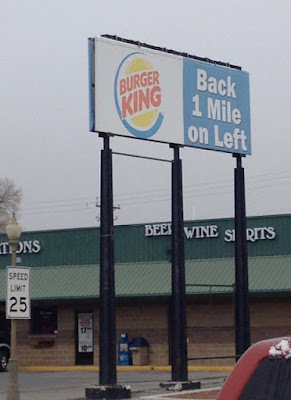 This is the first time I've ever seen a billboard, encouraging motorists to turn around and go back to a business they had already passed. 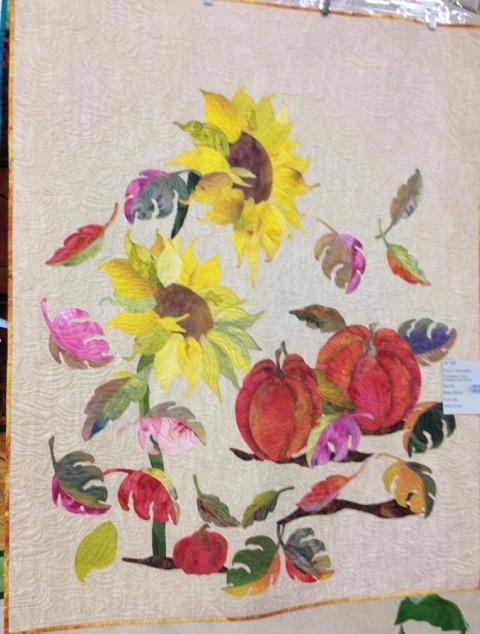 On the way home from a North Dakota, my sister, brother-in-law, and I stopped for lunch in Fort Morgan, CO. Next door to the restaurant was a quilt shop, and of course, Marilyn and I had to go inside. While I was purchasing a pattern and some yardage, Marilyn noticed a jar by the register that contained several lint brushes, and the clerk told us to each take one. 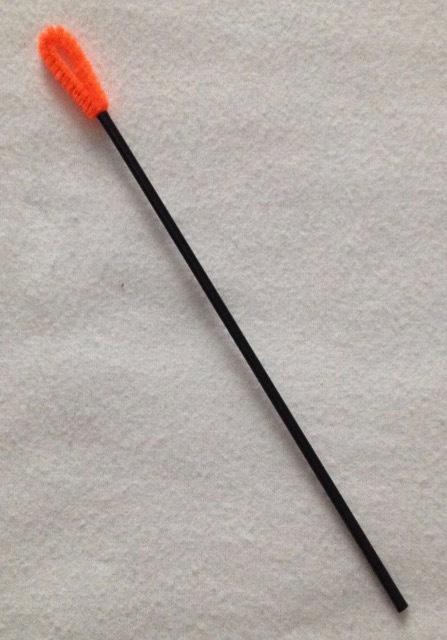 This "brush" was made from a beverage straw (the thin kind used by bars) and a bit of chenille pipe cleaner. It is a simple device but very clever and useful. 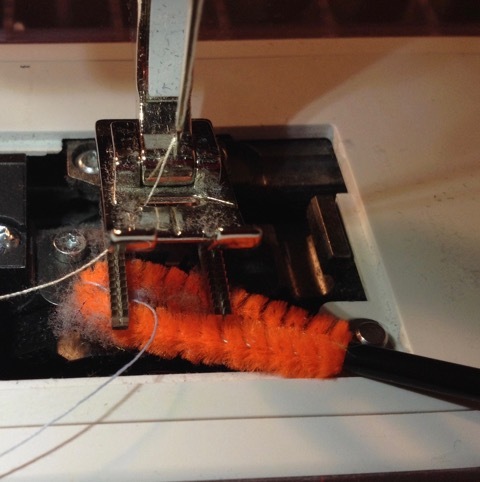 The pipe cleaner is merely twisted and then tucked inside the straw, but I may eventually glue the pipe cleaner in place to prevent it from pulling out and/or falling into the machine. I found an online tutorial for these lint brushes. After reading the post last week about the Free Little Library at the high school track, Julie W. (my knitting pal) found the Little Library near the golf course and snapped a photo for me. With Julie's discovery, it appears two Little Libraries are located in the Riverton area and one in Lander. 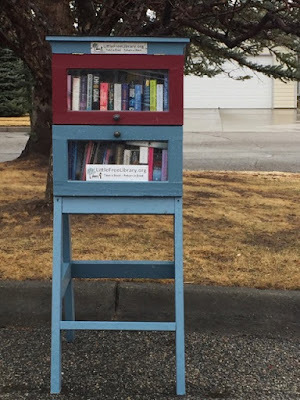 If anyone knows the location of any other Little Libraries in Fremont County, please contact me and I'll feature them in a post. My mailbox contained a surprise package on Friday - gifts from Ellen (The Ellen Report). Several weeks ago, Ellen asked if I would like some charity knitting yarn. I said I would gladly accept it if she couldn't find anyone in her area that could use it. The package arrived unexpectedly on Friday. Inside were the two large skeins of Bernat ombre yarn, a tube of lotion for dry hands (how did she know? 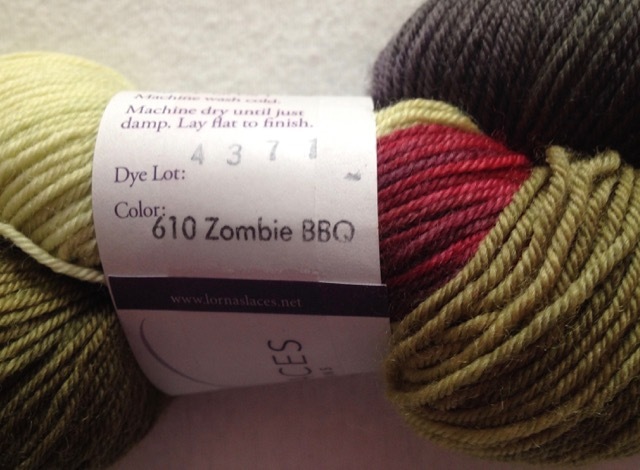 ), and a hank of Lorna's Laces Shepherd Sock in this FUN color way. . .
Ellen, thank you for making my day! 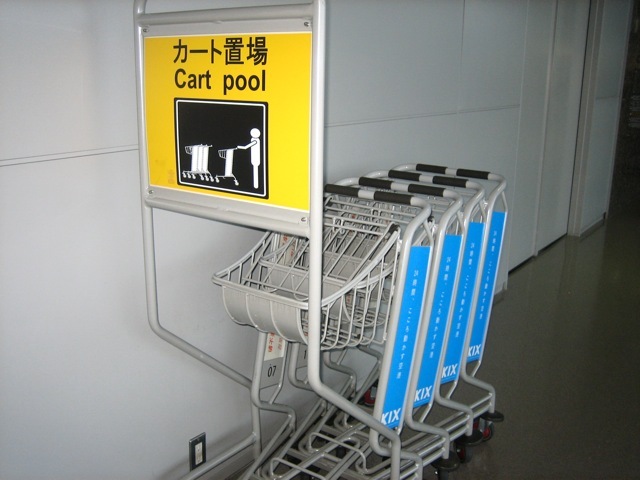 photo taken by Sheila N.
As I was preparing for this post, I found this photo of airport baggage carts that Sheila N. had shared with me several years ago. 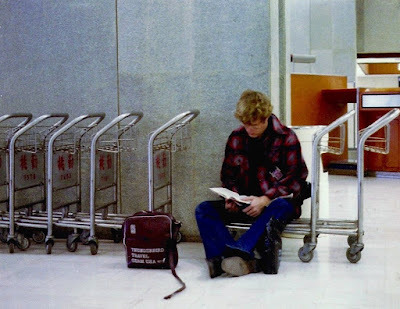 It reminded me of a photo I took in a Hong Kong airport in 1979. John and his wife Nancy were also teachers with the DODDS. Nancy taught at Sollars Elementary School and John taught at Robert D. Edgren High School on the Misawa AFB. I've posted about John and Nancy before in these earlier posts. The trips I took with other DODDS teachers were a lot of fun. This time of year, I am reminded of the cherry trees in front of my BOQ that were loaded with Sakura blossoms. The delicate pink against the blue sky made my heart sing. 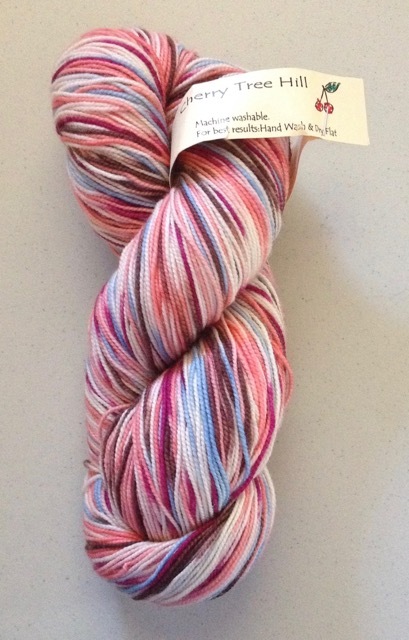 While rummaging through my sock yarn stash, I found this skein of yarn that ironically is named "Cherry Blossoms." In celebration of the Spring Equinox, I decided to knit a Hitchhiker Scarf - all garter stitch. 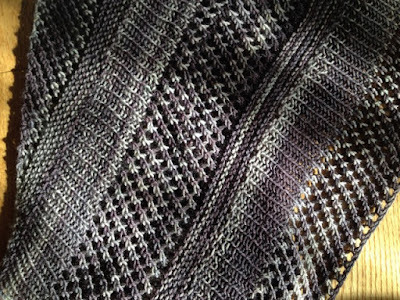 Garter stitch is a delight to knit because it is lays well and feels good in the hands. The pattern states to knit 41 "teeth," and I have only 13 left to knit. 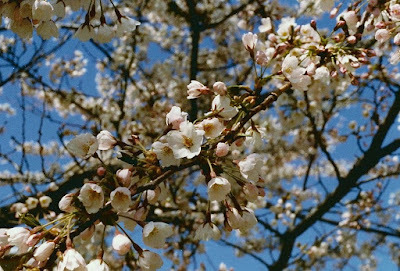 Earlier posts of cherry blossoms can be seen here. This sculpture, located near the front entrance of the Fargo hospital, caught my eye the first time Marilyn and I visited our sister in ICU. 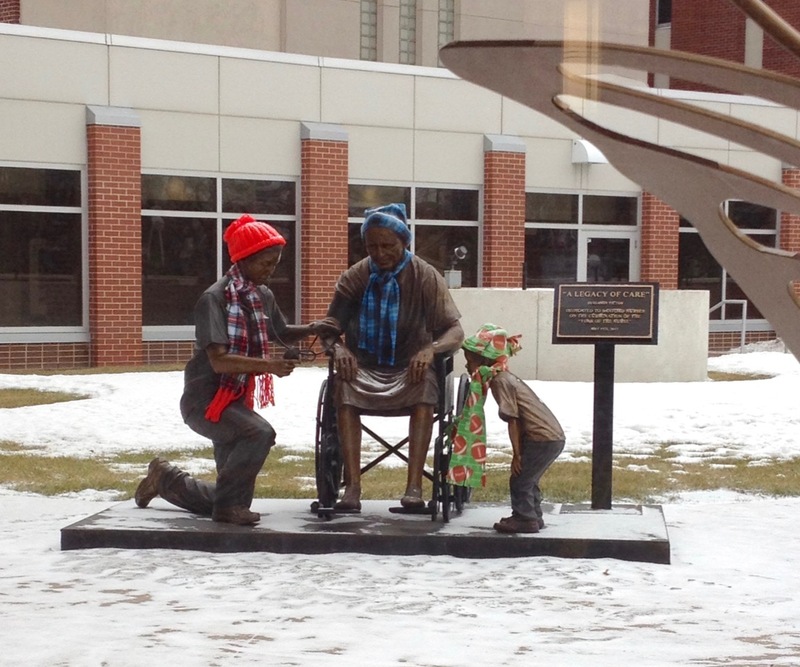 The hats and scarves added personalization to the sculpture and to the hospital surroundings. The tasteful "yarn bombing" made me smile. Have you seen yarn bombing in your community that made you smile? Brickless is off the needles, blocked, and ready for action. Oddly, most of the "purple" bled out when I soaked the piece for blocking. I added some vinegar to the rinse water just to be safe. The photo above reflects the true color of the yarn. 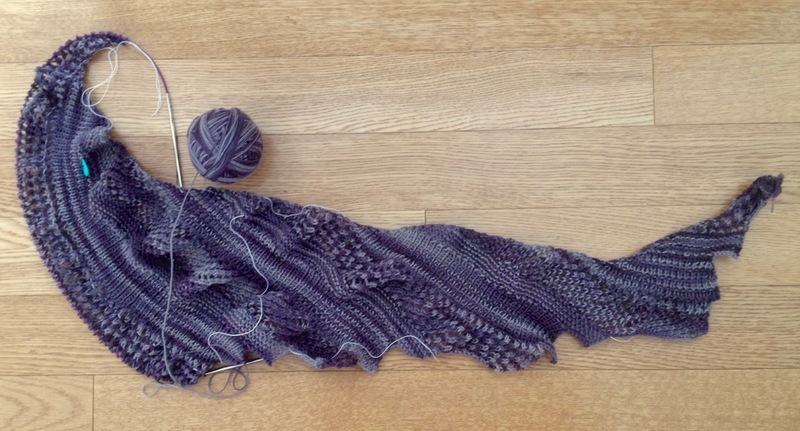 I was a bit worried about having enough yarn to complete the shawl, and it was close. I had 5 grams remaining from the 100 gram skein. Note the purple color in this photo. I probably blocked the points a bit too much, but I wanted the eyelet lace to show. The points will relax with wear. 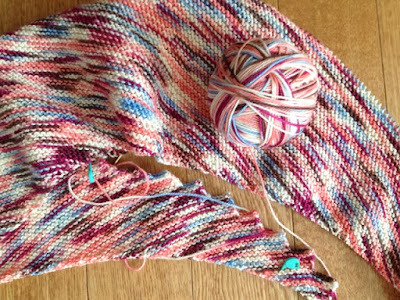 Knitting notes on earlier posts: Brickless Scarf and Brickless Progress. One more skein of yarn Slashed from my Stash. I went for a walk a couple of weeks ago and spotted another Free Little Library in my community. This one is right next to the football field and track. In 2014, I found a Little Library in Lander. 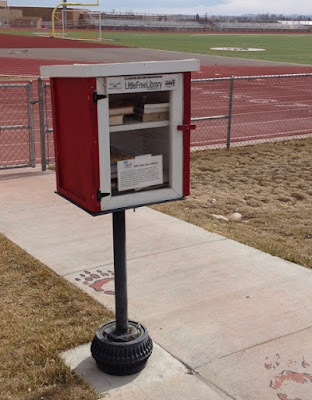 There may be another Little Library near the Riverton golf course: I'll check it out one of these days. Have you noticed any new Little Libraries in your community recently? 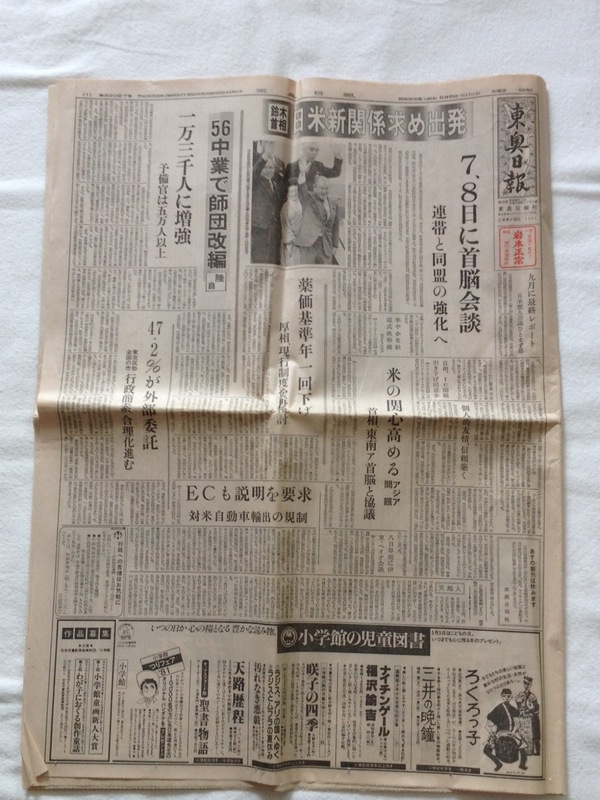 I loved looking at the local newspapers wherever I travelled in Asia. 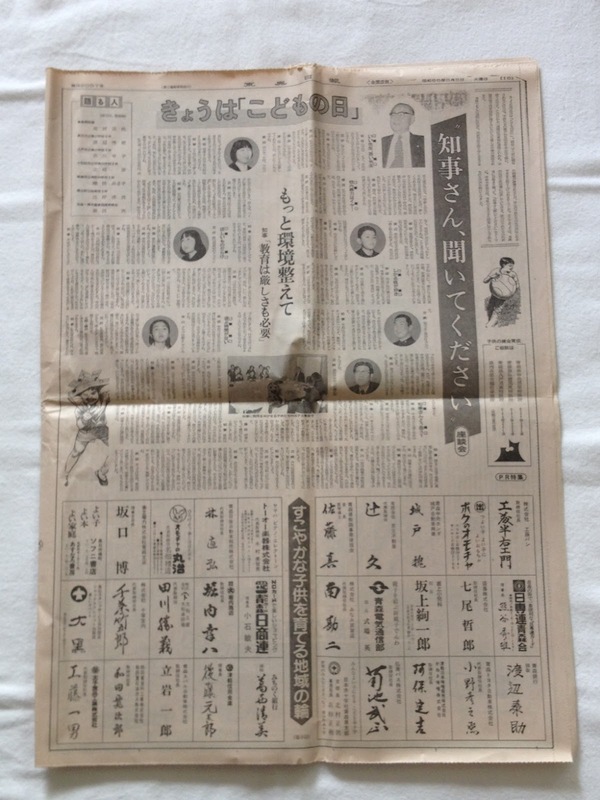 The layout of the Taiwan newspaper was very different to "western" newspapers. 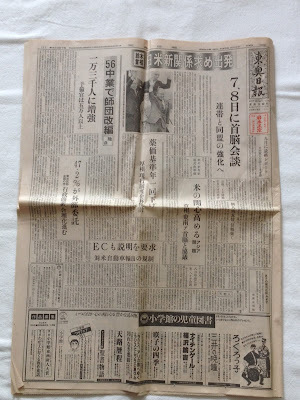 Note the paper is read from right to left in columns. 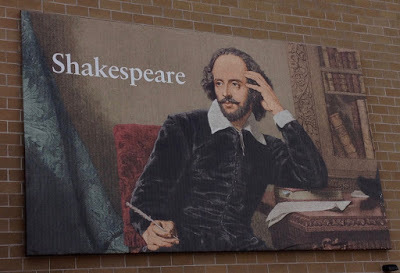 A new art banner was recently affixed to the exterior gymnasium wall at the Riverton Middle School, and as a retired Language Arts (English) teacher, I couldn't be happier with the subject of this banner. I taught several of Shakespeare's plays during my teaching career: Julius Caesar, Hamlet, King Lear, and Romeo and Juliet. I think it is important for students to be exposed to Shakespeare's writing and the language that he uses. Many teenagers are surprised that much of the phrases we use were actually penned by Shakespeare in the 1600s. 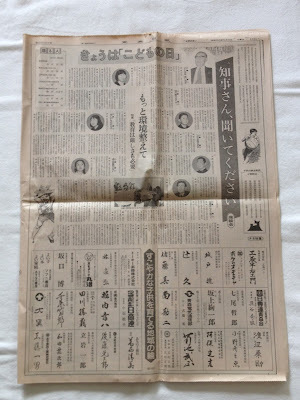 Other phrases can be seen here. 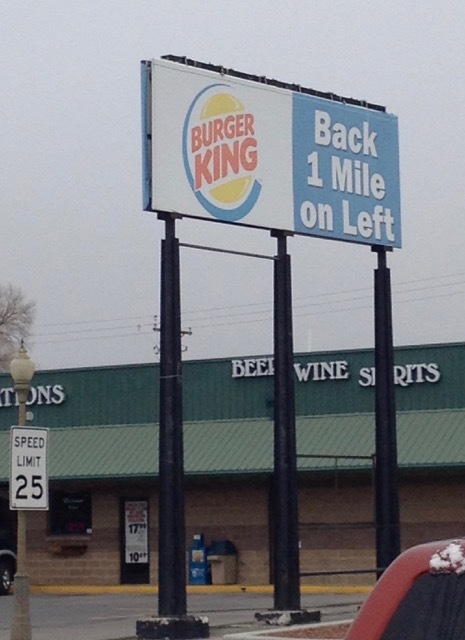 Art banners can be found all over Riverton, and can be seen in these earlier posts. I need to stop and take photos of at least two other banners that were added last year. The Ragg Socks are finished and ready to be gifted. 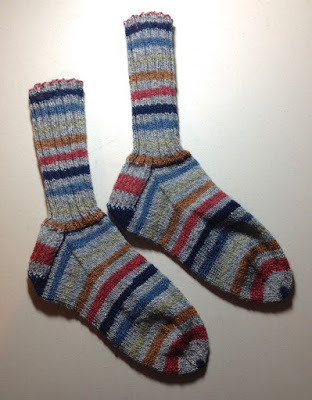 Note: I started the socks at the same spot in the color repeat to create a matching pair. Two more skeins used from my sock yarn stash. Slash the Stash progress can be seen here. I cannot take credit for this knitting tip (I got it from Vicky B. ), but it is worth sharing with other knitters. 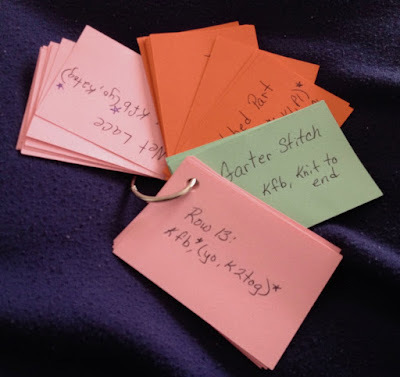 No matter how hard I try to keep track of stitch repeats and which row I am knitting, I ultimately get lost, so I end up frogging repeatedly. At the first Brickless shawl/scarf class, Vicky offered the participants blank flash cards (2" x 3") for a small fee. Written on each card is a SINGLE row. When a row is knit, the card is flipped to the back and the next row is visible. This technique made knitting the Brickless painless. When I need to stop, I place the "just finished this row" sticky note on the card. No confusion, no frustration, and a near perfect project. I knew I'd use this technique on future projects, so I ordered a box containing 1,000 unpunched cards. Blank flash cards can be purchased pre-punched or plain - just Google "colored, blank flash cards." Thanks for introducing me to this easy and helpful technique, Vicky! 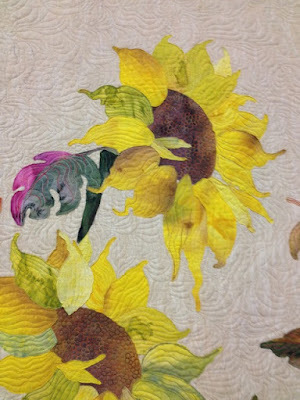 Part of the class was dyeing the fabric for the quilt. The colors were vibrant and perfect for the flowers, pumpkins, and leaves. 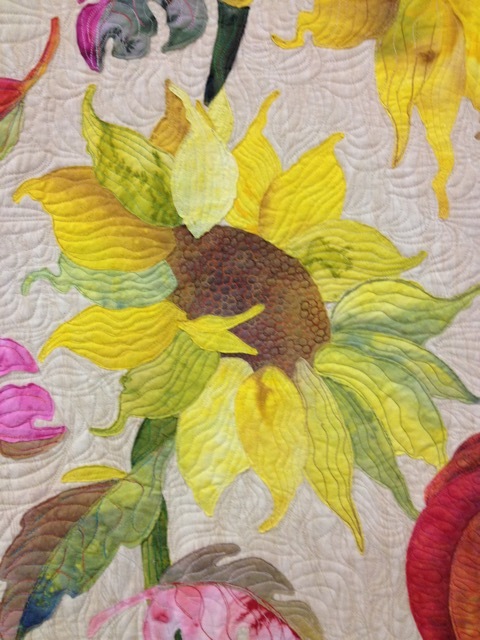 Barb David's wall hanging created at the Phil Beaver class at Quilting in the Tetons. 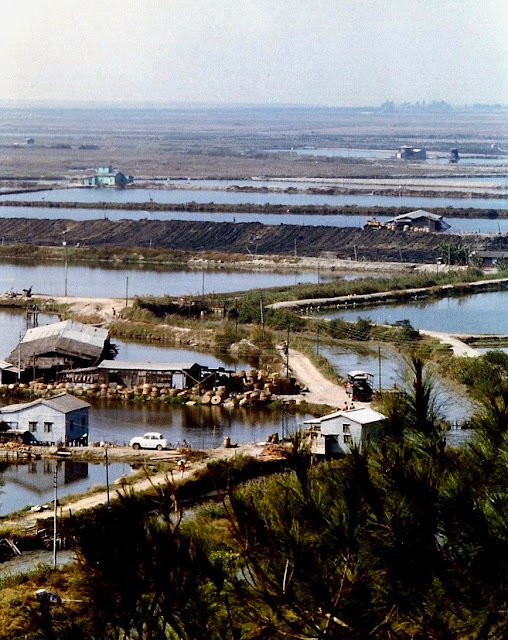 Another view of the rice fields in China: an earlier post can be seen here. 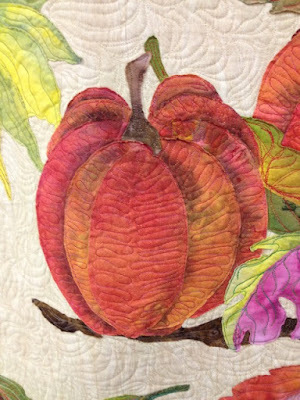 Dee recently posted about some peach-colored yarn that was giving her fits. She put the yarn in time out, purchased some new yarn and shook it at the misbehaving peach yarn. 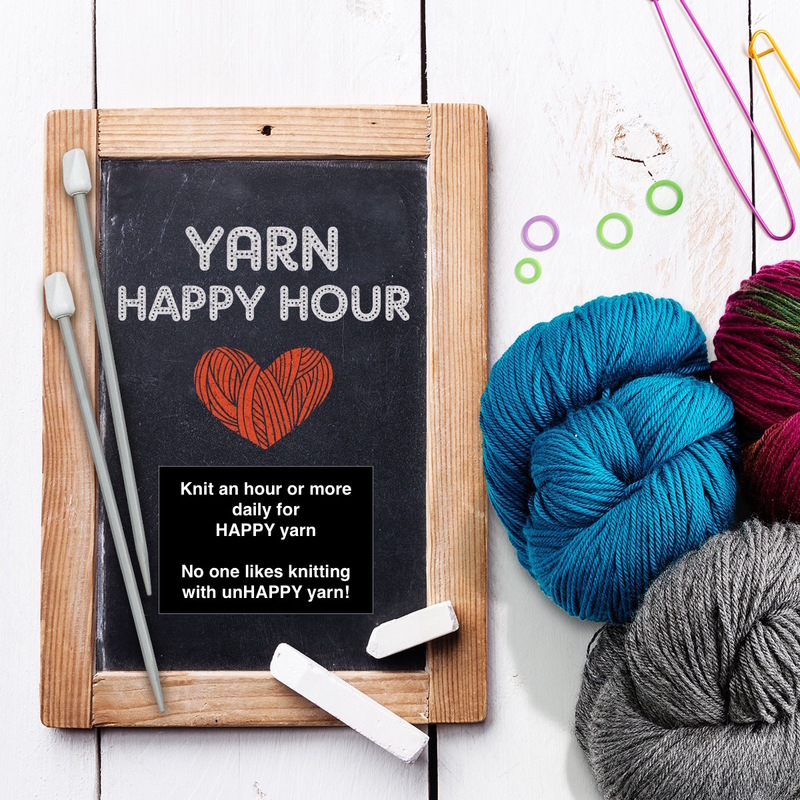 Unhappy yarn is frustrating to knit: it splits, doesn't lay flat, or refuses to be knit into a particular project. My solution has been to frog (rip out) and start a different project with the yarn, hoping I will eventually find what it wants to become. Very rarely, I've been known to actually throw unhappy yarn away; however, I have also offered it for adoption to my knitting buddies. 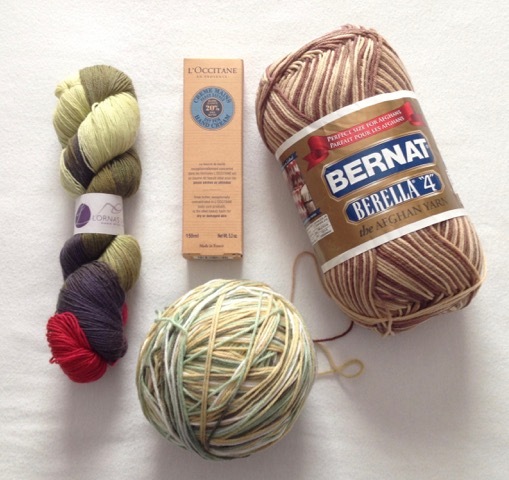 I've even donated cranky yarn to thrift shops, hoping that it will be happier in someone else's hands. How do you deal with unhappy or downright cranky yarn? Progress has been slow on the Brickless shawl/scarf. I just started the fifth repeat and will knit as long as I have yarn. 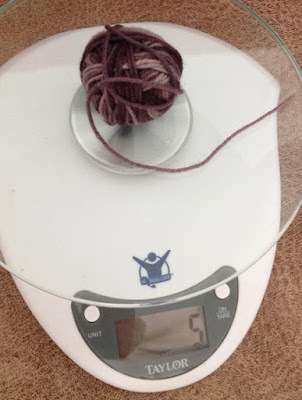 After the fourth repeat, I weighed the yarn and had 49 grams remaining from the original 100 gram skein. I'm optomistic that the remaining yarn will be sufficient to finish the fifth repeat and knit a final lace section, but it will be close. An earlier post on this project can be seen here. I don't know why this yarn is photographing as purple because it is really gray and charcoal. Marilyn purchased an adult coloring book and some markers for our great-niece while we were in Fargo. We asked her to color a page for each of us to put on our refrigerators, and she happily started coloring. 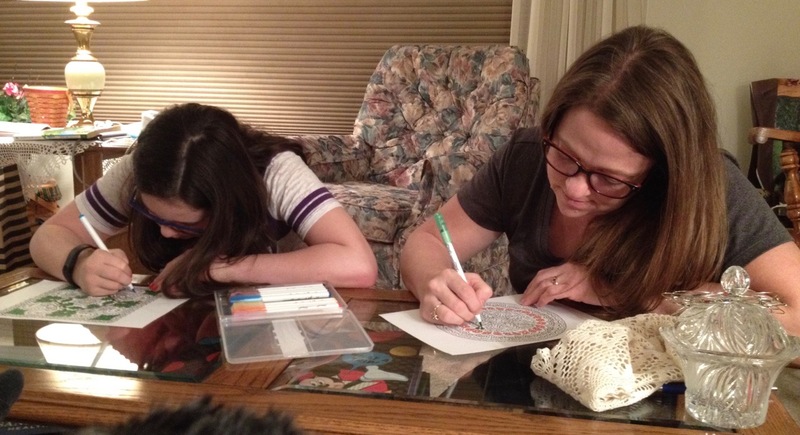 Later, she asked her mom to color, too, and then asked Marilyn and me to "judge" the finished mandalas. 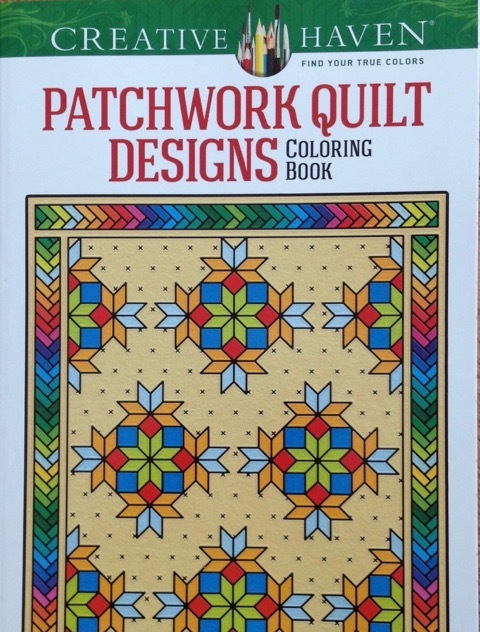 On Saturday, my friend Sue stopped by and surprised me with my own coloring book - one filled with quilt designs. I don't have markers or pencils, so I'll probably use crayons. 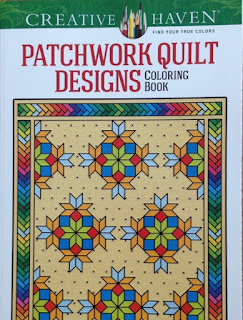 Thanks for thinking of me, Sue: I love the book and the designs.